To provide you with a simple and effective way to manage your Earthlink email services, mail2web.com has provided this convenient alternative to your Internet service provide's webmail application. If you are experiencing issues logging into your email account, please contact Earthlink for assistance. Simple setup. Always on Service. 24/7 In-house Expert Support. Have you ever tried checking your email on your mobile phone and wished there was a better way? With mail2web Mobile Email you can now get real-time push email, contacts and even your calendar, directly to smartphones like Windows Mobile, Apple iPhone, BlackBerry and more! Now you can access all of your information, your contacts and your schedule directly from your phone, wherever you are! And, updates are synchronized immediately! 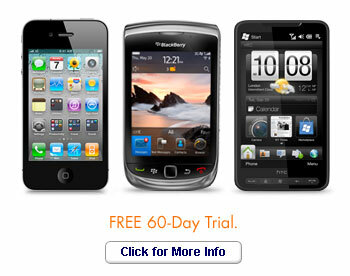 BlackBerry or Windows Mobile Phone.